For nearly two centuries, the MENARD family have cultivated the same land. The official and perfectly preserved land registry records show that in 1815 Jean MÉNARD owned a sizeable vineyard, and was already involved in distilling. 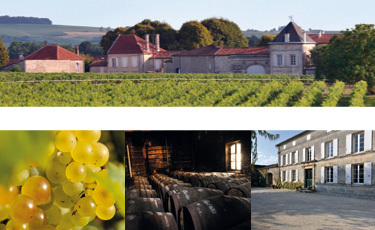 Today, the MÉNARD family vineyards stretch over around 80 hectares. On this land, entirely situated in Grande Champagne, the premier cru of the Cognac region, they harvest wines to produce MENARD Cognac - Grande Fine Champagne (AOC) and MENARD Pineau des Charentes (AOC). All these wines are distilled on site, in copper stills according to the traditional Charentaise method. Once distilled, the eau de vie is aged in Limousin oak barrels, where time works its slow magic to create Ménard Cognac. The extended time in the barrel gives the Cognac its finer qualities. Significant and noticeable changes occur in the barrel, such as a reduction in volume due to evaporation, and the lowering of its proof level. Moreover, the eau de vie absorbs tannin from the wood, and acquires its beautiful amber colour, its scent, and its incomparable taste – that "rancio" so characteristic of aged cognacs.